It’s been almost a year since I started learning calligraphy. Here are 5 things I wish I had been told at the very beginning. 1. Learning calligraphy is going to take a ton of practice. There is no way around that. 2. Don’t skip the calligraphy BASICS. I get questions from frustrated people all the time who just can’t seem to ‘get it right’ with their calligraphy. And the reason is simple. You know how to write, you own some brush pens, and you’ve watched tons and tons of Instagram videos. You should be able to wing it, right? Wrong. With lettering and calligraphy getting increasingly popular, and lots of awesome artists posting their ‘lettering worksheets’ for sale, it’s tempting to jump right in and start writing words. The problem with that, is that you’re just copying someone else’s style without learning the basics. If we go back to the example of the musical instrument- picking up a brush pen and copying someone’s else’s style would be like picking up an instrument and learning a song without knowing how to play each note. You could eventually figure out how to play the song by copying the sounds, but if someone asked you to play them a ‘G minor’, you wouldn’t know how. You skipped a step. In calligraphy, you need to start with the very, very basics. These are referred to as ‘strokes’. All of your letters are made up of strokes. So, practice the strokes- over, and over, and over again- until they’re consistent. The more consistent your strokes, the more consistent your letters. You should not be attempting letters and words until you master the strokes. Simple. Pieces Calligraphy has an awesome series of tutorials on all of the brush calligraphy basic strokes. Check them out, and then get practicing. 3. Get the right lettering supplies. Yes, some will argue and say that you can practice at the beginning with cheap supplies- just until you know what you’re doing enough to get the expensive ones. And this is true- to an extent. You can practice with any supplies you want at the beginning- a pencil, a ballpoint pen, Crayola markers, your kids colouring supplies- but when you want to get serious, you need the right supplies. The simple reason: brush pens, inks, nibs, and papers are not created equal. If you use the wrong ones, you will frustrate yourself and ruin your supplies. Want more brush pen options? Check out my previous comparison on brush pens. 4. Don’t get overwhelmed by Instagram- use it to your advantage. Instagram only shows you the best of the best. It can be incredibly overwhelming, even to someone who feels fairly confident in their abilities. To use it to its fullest, here are the rules I use. -like, comment and engage with others- tell people when they’ve done something you loved! -copy people’s work without giving them credit. If you use someone’s work to learn from, and are proud of your recreation, then by all means- post it! But make sure you give the person credit. -follow a million accounts, and never interact with them. It’s better to follow a couple that really inspire you, and engage with them. 5. Connect with others as much as you can. 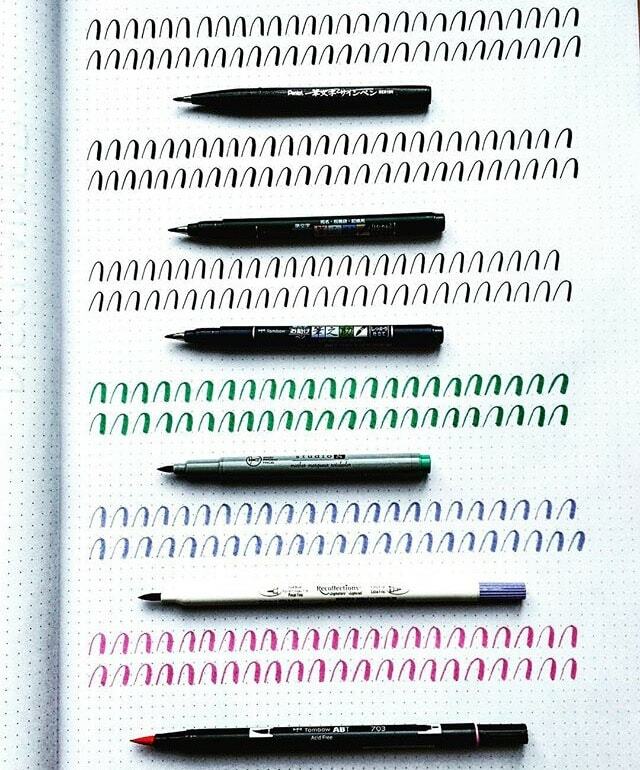 As much as calligraphy & lettering are trendy, the community of artists who are doing it on Instagram is pretty tight. When you browse hashtags and look through your search page, you start to come across the same people over and over again. If you find someone whose style you really love, or who you think you’d get along with in real life, MESSAGE THEM! Be genuine- tell them what you love about their work, ask questions, and start a conversation. Learning calligraphy & lettering is tough, and it’s so nice to have other like-minded people on your side. I am a firm, firm believer in community over competition. So reach out to others- engage with them, tell them when you like their stuff. It really does go far. That’s precisely how I met my best “calligrafriend”, Emma (of Black Chalk Collective) who is on the other side of the world. And a month later, we started the Letter Archive together! Great things happen when you reach out. Hopefully this reaches someone who is just getting started, and gives them that extra push to do it. It really is an awesome community to be a part of- so get started and join in! Enjoy this post? Are you a beginner yourself, and have questions? Or are you an expert, and have more tips for beginners? I’d LOVE to hear from you in the comments! Thank you so msweet choir the great tips and encouragement! I am definitely guilty of #2 😬. The graphic design class I took in college and the one calligraphy elective I took in junior high (years and years ago!!) probably made me feel overly confident. I’ll definitely get back to basics! P.S- I’m in the process of making some guidesheets for the basics. Stay tuned! Your words are so inspiring and I really love your lettering work! 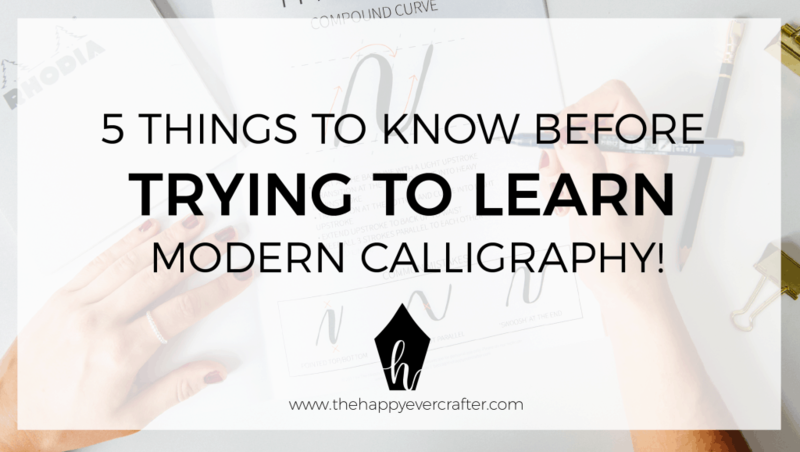 I am new to the calligraphy/lettering world and this post was just what I needed to read! I will keep practicing, thanks for the inspiration! Hi Hailey! So glad my words can help you 🙂 Stick to the practice and you’ll see steady improvements- I promise! This post made me more motivated to keep going 🙂 thank you! Thank you for this great advice! I am new to hand lettering/calligraphy and this has given me good direction on where and how to start. Thank you! I am guilty of trying(key word, "trying" lol) to create words from watching other peoples videos. Lol. Thank you for this post! P.s. Your Instagram feed is really great! Beautiful work! Stay tuned- I’ll have "basics" guidesheets so, so soon!! I’m a beginner in hand lettering , thanks alot for this blog, about the item 5 Connect with others as much as you can. This idea is new for me, I never think to direct message the artist that her works was inspired me. this is really new idea. Thank you 💙. I came across your Instagram account through Black Chalk account that was "suggested" on my Instagram about a month ago. Since then I have started another Instagram strictly for art and it’s so freeing! I am signed up for your #showmeyourdrills session starting in a few days and I’ve been reading your blog and facebook and Instagram- okay pretty much stalker status at this point 😉. I have found instead of buying "all the things" I’m taking your advice of 1 pen 1 paper and go from there even though I have a super tough time not buying anything that has color. You have motivated and inspired me and it could not have come at a better time in my life, so thank you. I’m having a read of your blog before I dive into the lessons (I subscribed). The drills are very familiar since they remind me of the "springs" my Mom (a now retired teacher) had me do day after day after my Grade 2 teacher told her that my cursive handwriting wasn’t up to par. I drew springs til my hand cramped. But now, even at 51, people comment on how nice my handwriting is. Thanks Mom! One question for you: I noticed the links to the supplies are on Amazon, and most of them don’t ship here. Are these available locally in Ottawa (Michaels, Wallacks) ? Thanks so much for the heads up about learning the basic strokes! It was your blog where I first heard about them and it is making calligraphy seem so much more understandable knowing how the individual letters are formed. I am happy to practice.